Remember as a kid when you'd find a box of miscellaneous stuff at your grandparent's house? You didn't know what any of it was and nothing seemed to have any specific connection to your life that you were aware of at the time, but it was still somehow fascinating to sit there and leaf through the yellowed scraps of paper, photographs and clippings from the newspaper. That's a lot like what Douglas Wilson sent us for Swapping. It's a wooden cigar box filled to the brim with everything from a bridge point calculator by Charles H. Goren, the 'World's No. 1 Ranking Bridge Player,' a 1946 postcard from River Gorge, Colorado, an educational film strip about Mark Twain and countless aged pieces of paper. As a whole, there's no cohesive purpose for them to all be packaged together. But we defy you not to open the box and instantly find yourself slowly handling each and every piece with a delicate, quiet reverence. Limited-edition of only 15. 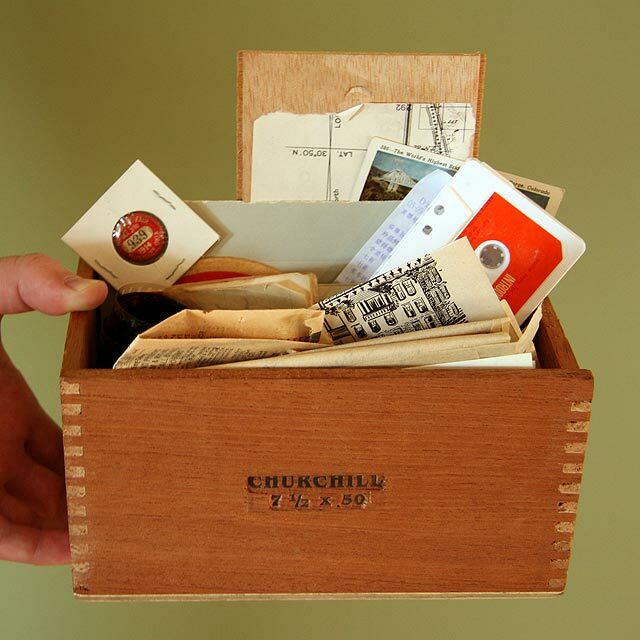 Hand-selected ephemera, assembled in a beautiful wooden box exclusively for The Swap Meat. There's no telling what you'll get but judging by the one we received there's no chance you'll be disappointed either. Signed, numbered and custom-shipped by the artist. View all the featured items and exclusives in The Swap Meat.